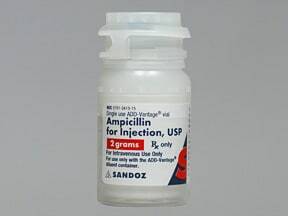 Ampicillin is used to treat a wide variety of bacterial infections. It is a penicillin-type antibiotic. It works by stopping the growth of bacteria. This medication is given by injection into a vein (intravenously-IV) or into a muscle (intramuscularly-IM) by a healthcare professional as directed by your doctor. If you are giving the injection yourself, learn all preparation and usage instructions from your healthcare professional. Follow all instructions for proper mixing and dilution with the correct IV fluids. Direct injections into the vein should be done slowly (over at least 10-15 minutes) to avoid the risk of seizures. If you have questions regarding the use of this medication, consult your pharmacist. Before using this product, check it visually for particles or discoloration. If either is present, do not use this product. The dosage is based on your medical condition, response to therapy, and weight. Continue to use this medication until the full-prescribed amount is finished even if symptoms disappear after a few days. Stopping the medication too early may allow bacteria to continue to grow, which may result in a relapse of the infection. What conditions does Ampicillin Sodium Vial With Threaded Port treat? Tell your doctor right away if any of these rare but very serious side effects occur: dark urine, persistent nausea or vomiting, stomach/abdominal pain, yellowing eyes or skin, easy bruising or bleeding, persistent sore throat or fever. 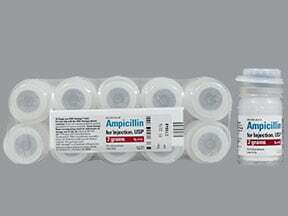 Ampicillin can commonly cause a mild rash that is usually not serious. However, you may not be able to tell it apart from a rare rash that could be a sign of a severe allergic reaction. Therefore, seek immediate medical attention if you develop any rash. List Ampicillin Sodium Vial With Threaded Port side effects by likelihood and severity. 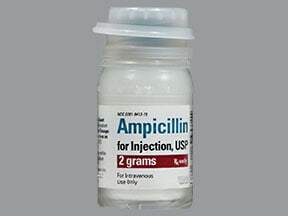 Before using ampicillin, tell your doctor or pharmacist if you are allergic to it; or to penicillin or cephalosporin antibiotics; or if you have any other allergies. This product may contain inactive ingredients, which can cause allergic reactions or other problems. Talk to your pharmacist for more details. Ampicillin may cause live bacterial vaccines (such as typhoid vaccine) to not work as well. Do not have any immunizations/vaccinations while using this medication unless your doctor tells you to. 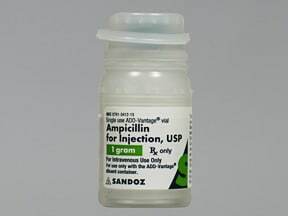 Ampicillin passes into breast milk. Consult your doctor before breast-feeding. What should I know regarding pregnancy, nursing and administering Ampicillin Sodium Vial With Threaded Port to children or the elderly? Before using this medication, tell your doctor or pharmacist of all prescription and nonprescription/herbal products you may use, especially of: methotrexate, tetracyclines, warfarin. Ampicillin may cause false positive results with certain diabetic urine testing products (cupric sulfate-type). This drug may also affect the results of certain lab tests. Make sure laboratory personnel and your doctors know you use this drug. Does Ampicillin Sodium Vial With Threaded Port interact with other medications? This medication must be stored properly. Review storage instructions with your pharmacist. Store mixed intravenous ampicillin bags in the refrigerator between 36-46 degrees F (2-8 degrees C). Let a refrigerated bag sit at room temperature at least one hour before using. Check the expiration date before using. Store vials at room temperature (59-86 degrees F or 15-30 degrees C) away from light and moisture. Do not store in the bathroom. Keep all medicines away from children and pets. Are you taking Ampicillin Sodium Vial With Threaded Port? Are you considering switching to Ampicillin Sodium Vial With Threaded Port? How long have you been taking Ampicillin Sodium Vial With Threaded Port?